Detailed photographs and diagrams show how to turn a basic HO train set into a complete 4 x 8 layout in eight easy steps!. 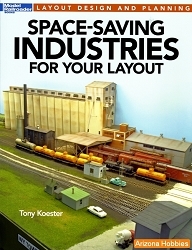 Includes instructions on constructing bench work, laying track, constructing scenery, and more. Saddle-stitched softcover; 8.25 x 10.75 in. ; 96 pp. ; 60 Color photographs; 120 B&W photographs.